The GT-Mconf team, working in the Laboratory of Prav (located in the Institute of Informatics, Federal University of Rio Grande do Sul, Brazil), have reached another milestone in creating a BigBlueButton Android client. 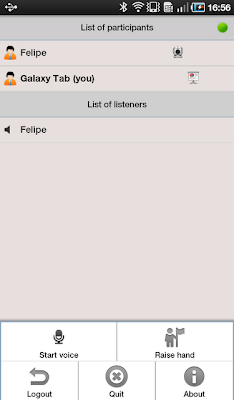 Felipe Cecagno posted the availability of the first public release for download. This release supports both chat and voice. We downloaded their client a within a few minutes were using our android phones to listen and speak in a BigBlueButton conference. Very cool! For further links, check out Felipe’s post to bigbluebutton-dev. This is great progress Felipe. Getting voice working is a BIG milestone.